Summary: Control centers require a specific number of factors to appropriately prevent damages from occurring. 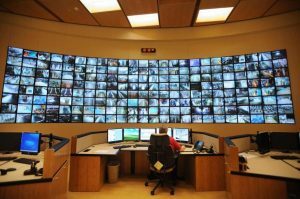 A command center requires an appropriate amount of security in place to prevent and mitigate damages. Depending on the type of building you own, as well as the security risks it faces, the command center might require an additional layer of construction materials. Some suggest metal studs and a layer of drywall – even security mesh would do. In order to accommodate your wires, a raised computer floor is ideal. Note that wires drooping from the ceiling can obscure the view of the monitors and be at risk for accidental snags. Digital video recorders and other sensitive computer equipment should be kept in a separate space where one can filter the room and control the temperature. This is done mainly to prolong the life of the equipment. If there isn’t enough room, use computer room filters for the air in the primary control center. Your standard filtration kits aren’t nearly enough to keep harmful dirt and dust out of the air. Always make sure that you have enough storage capability to handle all the storage media. If you can, invest in enough storage space to handle 60 to 90 days of video. While you might be planning all these ideas in your head, you should hire an experienced team to create the actual design. A seasoned team can make use of your space effectively and enable you to make fewer compromises – cutting costs and saving time. Remember, a security control center is your ideal brain for your building. It’s important that you avoid compromising in ways to limit its capabilities. Blog submitted by Constant Technologies, Inc.: Constanttech.com designs, manufactures, and installs control center, and networking operations center furniture. For more information, visit them online today.